Combine Havis display with a mount and accessories to tap into a new level of mobile flexibility. 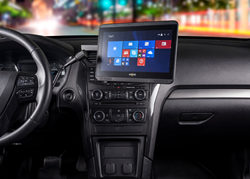 Havis Inc., a leading manufacturer of mobile office solutions for mobile professionals, has introduced a new lightweight touch screen display that mounts directly to a vehicle’s dash panel. The new space-saving display functions as an external monitor, providing the option of docking and mounting computing devices in the trunk to maximize space in the cabin and create a comfortable work environment that optimizes a fleet’s productivity. The TSD-101 Havis Touch Screen Display features rapid adjustments and easy back-and-forth toggle, giving the user a full range of motions to maintain a comfortable posture. The anti-glare screen and red monochrome night mode are designed to minimize eyestrain. The new display gives drivers and passengers convenient access to device settings, with two 2.0W integrated stereo speakers, volume and brightness adjustments, a USB port, and a power button that can black out the screen without rebooting the computing device, whether for privacy or to prevent driver distraction. The display has a screen size of 11.6’’ length x 8.5’’ width x 1.4’’ depth, and features a high resolution of 1366 x 768 pixels, with a total weight of 2.2 lbs. The Havis Touch Screen Display can be attached to the new vehicle-specific C-DMM-2000 Series Dash Monitor Mounts, which position the touch screen display within a convenient line of sight. A friction-based hinge on the new mount series creates a tilt swivel motion for a range of left, right and upward adjustments, allowing users to lift the touch screen display and easily access the OEM control panel. Havis’ vehicle-specific dash mounts are designed for easy installation to pull trim pieces with minimal fastening and modification, and are configurable for additional items up to 4 lbs. The mount series’ compact design optimizes space for additional equipment and peripherals to be mounted in the cabin. Havis’ C-DMM-2000 Series Mounts are compatible with Ford Interceptor Utility and Sedan, Chevy Tahoe, Dodge Charger, Ford Transit and Ford F-150 and F-250 to 750 models. While the C-DMM-2000 Series mounts are ideal for the Touch Screen Display, they can also be attached to any mount with a VESA 75 hole pattern. Havis offers related products and accessories to create a total mobile office solution that maximizes a fleet’s productivity, including trunk mounts and keyboards. Trunk mounts save space in the cabin by stowing computing devices and docking stations elsewhere in the vehicle through a variety of solutions, including slide out trays, trunk fold down mounts, trunk side mounts, utility storage boxes and fold-up equipment trays. Another recommended accessory is the new Havis Rugged Keyboard and Keyboard Mount (patent pending) System with standard USB connection. The keyboard’s red monochrome illumination backlight is designed to reduce eye strain while the silicone material covering makes cleaning easy. Havis’ patent-pending Keyboard Mount provides quick release of the rugged keyboard and an integrated forward/backward function with a 3.875” range to allow users to adjust the rugged keyboard to a comfortable position. The mount is made of high-performance PC-ABS thermoplastics and reinforced glass fiber polymer for outstanding strength, heat resistance and finish. Havis docking stations, equipment mounts and display are tested to the industry’s highest safety standards, including vibration and environmental testing to ensure quality performance in the most rugged conditions. For more information on the Havis Touch Screen Display, Vehicle-Specific Mounts and related products, visit http://www.havis.com/TSD.